I remember, in my childhood, when I got my very first Venus fly trap. I remember that little green plant in a plastic dome with the peculiar looking traps sitting on the kitchen table; it looked so fragile. At the same time, in my mind, that little plant was the representation of the perfect predator. Apparently immobile, perfectly still, and then….SNAP! Eating time! 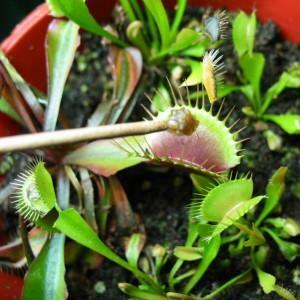 As cultivators, we must keep in mind that the Venus fly trap (Dionaea muscipula) is carnivorous from the time a baby flytrap produces its first tiny seedling trap. This mean that even the very little recently sprouted seedlings are capable of capturing prey and can benefit greatly, growing much more quickly, from being fed. 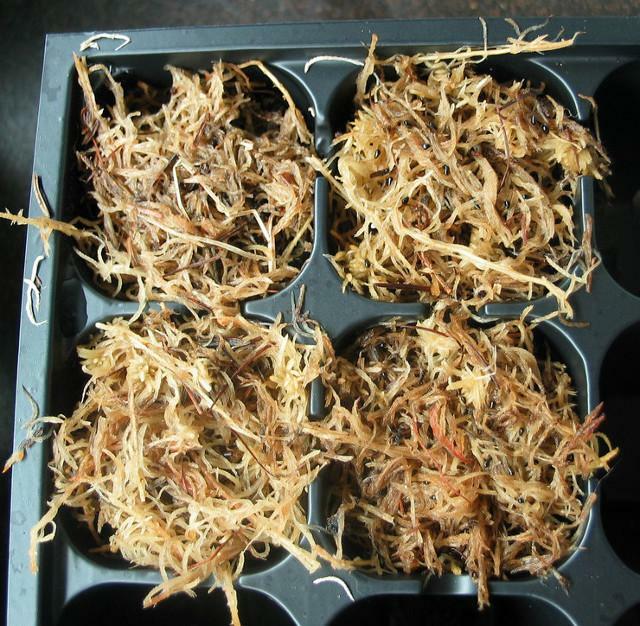 Below I will describe my very personal technique for making theses seedlings thrive at their best, using freeze-dried bloodworms. 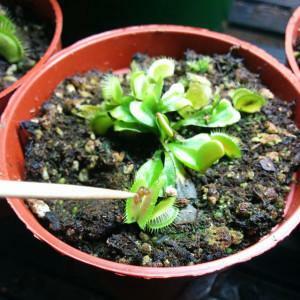 I have successfully raised Venus flytraps from seed to adult-sized, flowering plants in just 8 months using this technique! At the end of the article, we will discuss how to feed other carnivorous plants. 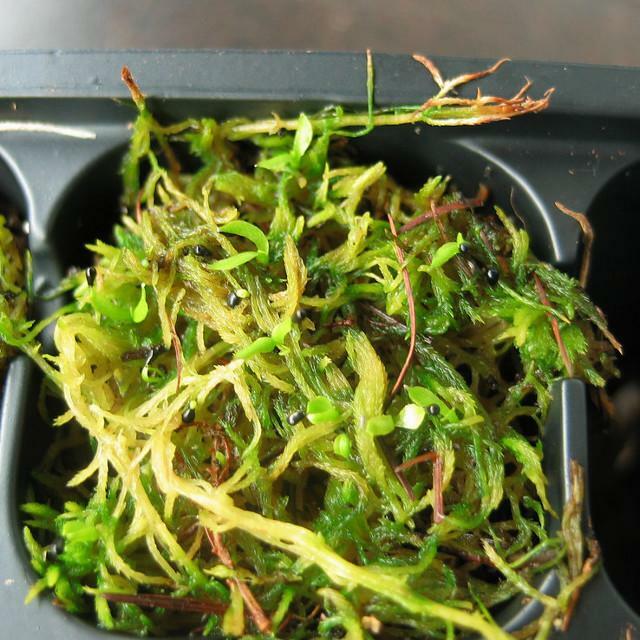 So let’s get started on how to grow Venus fly traps from a seed to adulthood in a few months! 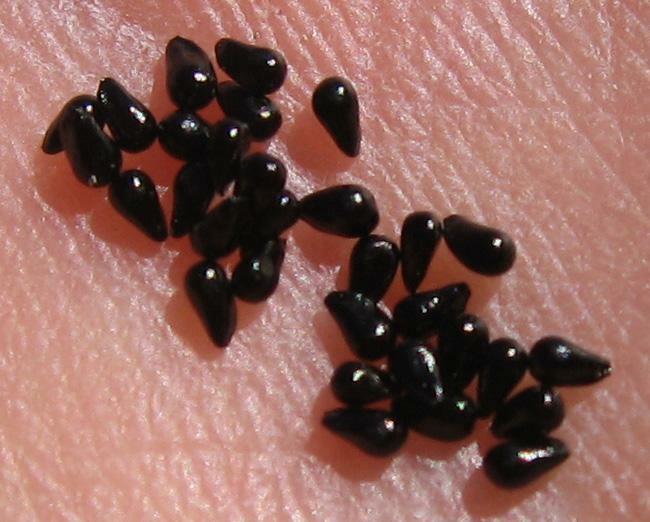 To the left is a photo of fresh Venus fly trap seeds. A good and strong germination of our Venus flytrap seeds will be especially important to our success of quickly growing these seeds to adulthood. Similar to humans, when one gets a good start in life, what follows will be easier. The same is true for baby Venus flytraps! With a good and fast start, a baby Venus flytrap will be able to keep up the same growing speed and this will make the seedling much stronger and allow it to thrive from the very beginning of its life. As seen in the photo to the right, the next step is sowing the seeds for germination. My preferred germination medium is long-fiber sphagnum moss (dead) or live sphagnum moss. Just sprinkle the seeds on the surface because as soon as they germinated, they baby flytraps will need a lot of light. Do not bury them! The seeds will sprout quite quickly in high relative humidity, and at relatively high temperatures. In my setup, I have massive and quick germination at 30°C during the day and 25°C during the night. This could be called “lowland conditions” for those people who are in the carnivorous plant hobby. Germination will normally occur from 10 to 20 days after sowing the seeds but can take much more longer if conditions are not ideal. In order to ensure elevated humidity, seeds should be started under a plastic dome or in any humid terrarium. Very high relative humidity will result in much quicker germination. From my experience, from 90% to 100% relative humidity is the best. After the germination, I suggest keeping the relative humidity very high. Some growers like to bring down the relative humidity in order to avoid algae and fungal growth, but for me, the seedling will grow much faster in very high humidity. After all, they are native to areas where the relative humidity is quite high. Shortly after germination, perhaps within the first 2 weeks, the recently sprouted baby Venus flytraps will develop their first tiny traps. These traps are fully functional and ready to do some serious business! The problem is that they are exceptionally small and thus can’t capture most types of natural prey. At this stage, the traps will have a kind of square form. 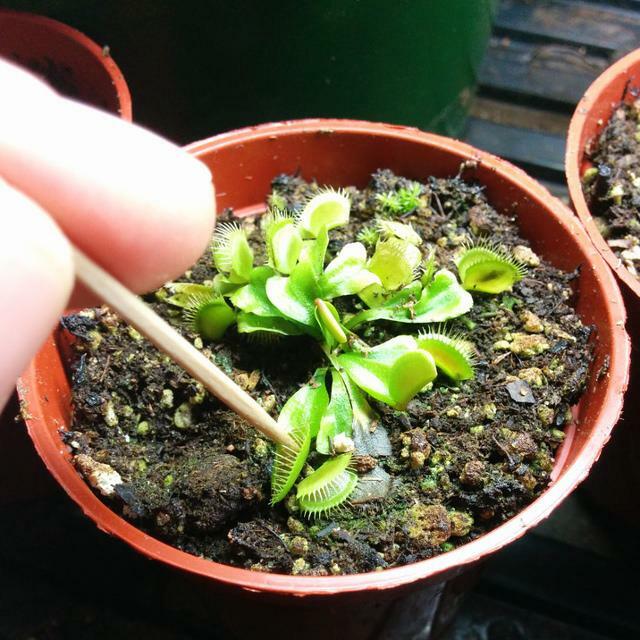 It is important to start feeding baby flytraps immediately after their first trap opens. 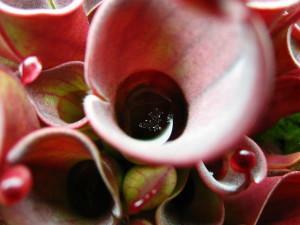 Let’s quickly discuss the nutritional value of the food that carnivorous plants capture through predation. 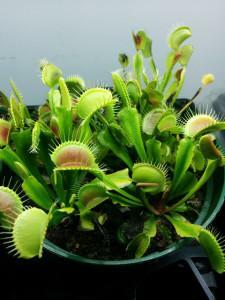 The closest relative of the Venus flytrap (Dionaea muscipula) is the King Sundew (Drosera regia). The amazing Drosera-relative, the Venus Flytrap evolved to a complete closed leaf to maximize nutrition gained from the digestion of prey! The reason is very simple; Drosera species and Venus flytraps (Dionaea) catch mostly flying insects with less nutritional value. The best meal a carnivorous plant can get is from crawling insects, like worms, spiders, big ants and other creepy crawlers. 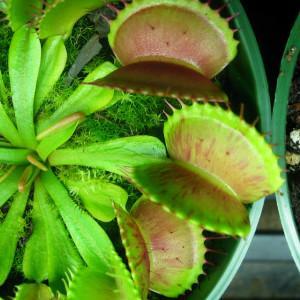 These sorts of insects are higher in nitrogen, which is the major element that carnivorous plants are trying to supplement by capturing prey. So with a totally closed trap instead of sticky leaf, the assimilation of nutrition is much better. So, it is for these reasons I will introduce the dehydrated freeze-dried bloodworms to my plant. This product is very high in crude proteins and nitrogen so the plant will be always on a boost. 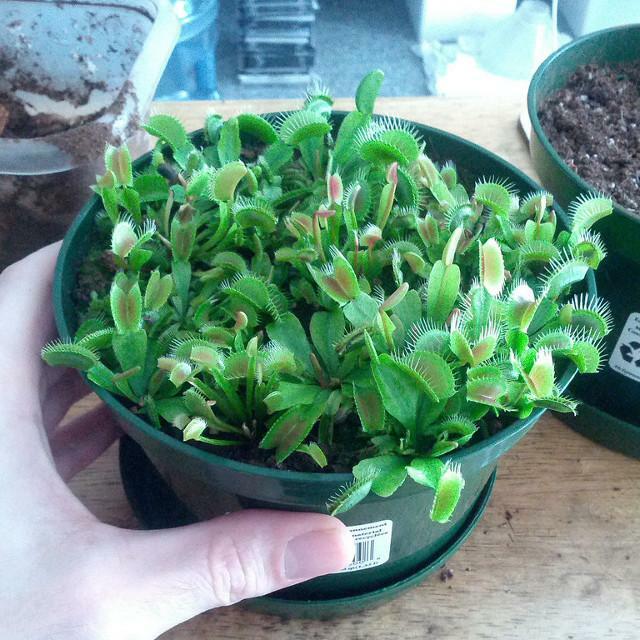 To the left you will see a photo of a pot of young, but very hungry, Venus fly trap (Dionaea muscipula) seedlings. Of course, feeding my young pets is my very personal method, and a big nursery cannot take the time to do this for all of the plants they grow. 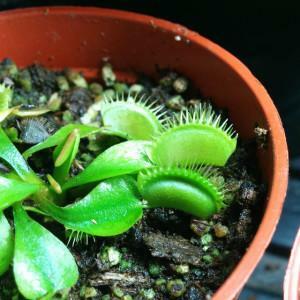 Should they choose to augment the nutrition of their Venus flytraps, most will probably use foliar fertilizing (spraying or misting the traps and leaves) or very light doses of fertilizer added to the soil to increase nutritional upate by the roots. And in vitro propagation of Venus flytraps allows for mass propagation of plants and also allows those plants to grow much more quickly in a sterile environment than they normally would in the real world. In the photo to the right, you can see the freeze-dried blood worms being re-hydrated. For plants like Venus fly traps and sundews, I’ve found that it is best to use re-hydrated blood worms. After removing the exess water, the worms can be rolled into little “meat balls” which can then be fed to your Venus flytrap, like you will see below. A good rule of thumb is to roll the freeze-dried blood worms into balls no larger than one-third the size of the trap. 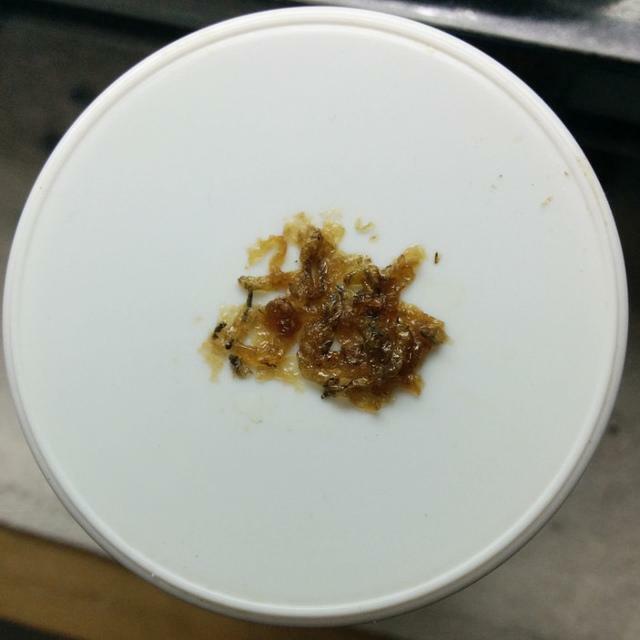 If too big of a piece is used, the trap could rot and die during the digestion process. 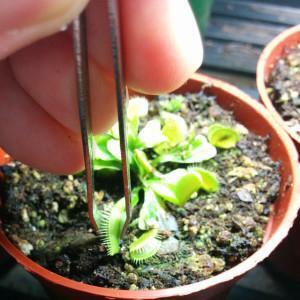 To actually feed your flytraps, simply put the little meat ball on the tip of a toothpick and then stick it in the trap to be fed and gently move it around inside the trap. The trigger hairs will be stimulated, and the trap will snap shut! On seedlings, the traps often close more slowly, so have patience when feeding them. In the above series of photos, you will see the feeding procedure in detail. The first photo shows the blood worm meat ball entering the trap. In the second (middle) photo, the trap has snapped shut, but has not yet sealed. When flytraps catch live prey, the prey struggles within the trap, continuing to hit the trigger hairs and telling the trap to seal and begin digestion. This saves the plant from attempting to digest something inanimate that entered the trap and will provide no nutrition. But in this case, our blood worms are nutritious enough that the plant will benefit from sealing the trap and beginning digestion. The problem is that there is no movement to stimulate the trap to seal. The solution for us is, with two toothpicks or a forceps or even our finger tips, to press very softly on each side of the trap. This will mimic a living insect still moving inside the trap, and the trap will seal. If the trap is not sealed after 30 minutes, press again very slowly and gently on each sides. In the photo to the left, you will see a sealed trap. This mean the digestion process has begun! This trap will stay closed for several days; normally about 5 days in warm conditions. A normal, healthy trap can absorb 2 to 4 meals before becoming inactive. Once the trap loses its ability to snap shut, it can still provide food for the plant through photosynthesis as long as it stays green, so do no cut off any inactive, but live, traps! In the photo to the right, you can see the forest of Venus fly traps that are rapidly growing now thanks to all of the feeding! 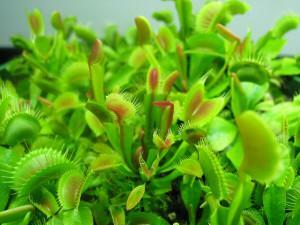 For maximum growth rate, it is best to try to feed one or two traps, once a week, on each plant. Raise the day temperature from 24°C (75°F) to 28°C (82°F) for 48 hours after each feeding session. High output T5 fluorescent tubes will full spectrum on a 16 hour photoperiod (16 hours on, 8 hours dark). Blue spectrum 2700K vertical tubes on each side of the setup. Push a little air flow around the plants. Water twice a week, from the top, with distilled water. It should be noted that the rehydrated blood worm diet can be used all the time, at any growing stage, not just on small or baby flytraps. 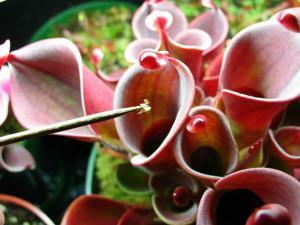 Almost all genus of carnivorous plants can be fed with freeze-dried blood worms. I say “almost all” because some plants are very hard to feed, like utricularia(s) and genlisea(s). 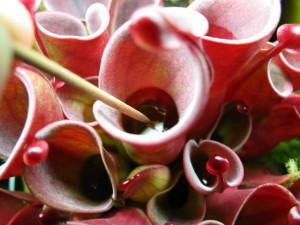 Even sarracenia minor is quite hard to feed. On some genus, you will have to grind the freeze-dried blood worms in order to make them more easily digested. For Heliamphora, Cephalotus, Nepenthes and some Sarracenia, the best method is dusting the freeze-dried blood worms inside the pitchers. 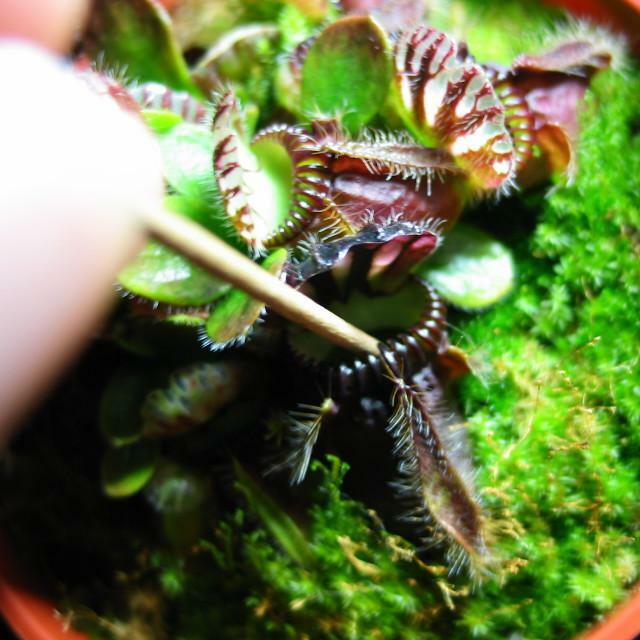 Or, if you prefer to wet the freeze-dried blood worms first, you can use a toothpick and deposit in the pitcher in a similar fashion to feeding Venus fly traps. 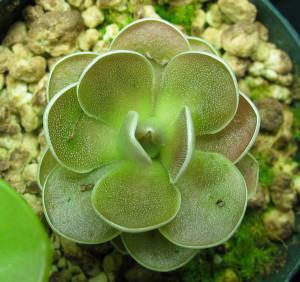 A photo of Cephalotus feeding can be seen on the left. And a photo of Pinguicula feeding with the “dusting method” can be seen below on the right. You can find freeze-dried blood worms in many pet shops, drugstores and big surface stores in the pet aisle. They are commonly used as fish food. 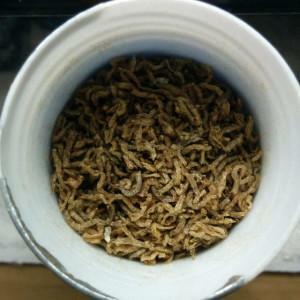 Many people are allergic to freeze-dried blood worms. Fortunately I’m not allergic, but I do know many people with the allergy, which can be quite acute and even life threatening in rare situations. So one should always take care and use toothpicks to avoid direct contact with the freeze-dried blood worms. With a single bottle you keep next to your growing place, you will make your plants thrive! 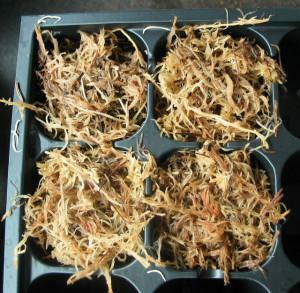 It’s cheap, fast, easy and a very rewarding method for growing these plants at accelerated speed!